WASHINGTON—Wearing large glasses with her hair tied in a ponytail, 29-year-old Li Pushen looks like an average Chinese university student. Last year, she arrived in the U.S. from her home in northern China to complete her graduate program in film and theatrical production design. But Pushen’s story is more than her academic pursuits. Central in her life is the traditional spiritual practice of Falun Gong, which has been subject to severe persecution and vilification by the Chinese Communist Party since 1999. Having learned Falun Gong as a child, Pushen spent her teenage years during the most intensive years of repression. Her mother has been locked in brainwashing centers twice. Now studying in Savannah, Georgia, Pushen went to participate in the annual rally, parade, and candlelight vigil in the nation’s capital that memorializes the known and unknown thousands of Falun Gong practitioners who have lost their lives at the hands of the Chinese authorities. While the overwhelming majority of Falun Gong practitioners are Chinese or ethnically Chinese, the practice has been taken up by people in over a hundred nations. Art therapist Liza Brkovich and her sister Frida Kats came from Uzbekistan and now live in New Jersey. 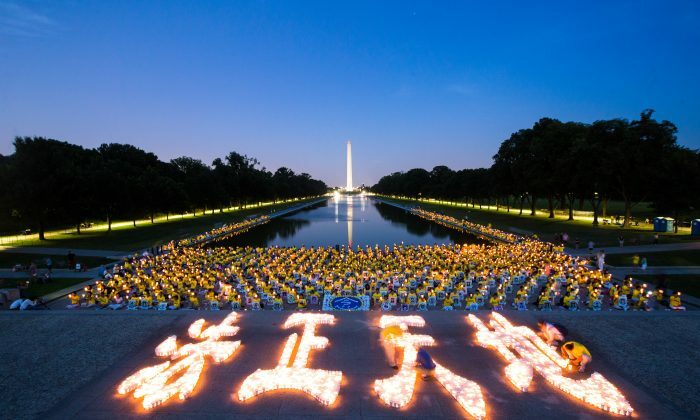 Liza has practiced Falun Gong since 1998; since 1999, she has attended every year’s candlelight vigil in the American capital. Though skeptical at first, Frida eventually learned Falun Gong, also known as Falun Dafa, from her sister. Both of the middle-aged women found that the practice improved their health and helped them lead better lives. The sisters often participate in Falun Gong events in New York. In parades, they take part in a group of performers who march while playing Chinese waist drums.